Former FBI agent Angela’s life has gone off the rails a bit since her Uncle Hector’s death and her partner’s murder. Now she’s out to get some answers–and maybe a little justice–in a slightly less traditional manner than has been her wont in the past. You see, she’s mysteriously received Hector’s amulets, and after touching them, she’s become filled with all sorts of power and abilities she never had before. In short, she’s now a superhuman, a “costume” as they’re known around town, quickly becoming known as White Tiger . . . or at least, that’s what she wants to be called. Everyone seems to keep getting her confused with other costumes! But with the help of some friends, it looks like Angela may just be on the right track to setting things right in her ‘hood. If you’ve been reading this blog for any time at all, you know Marvel comics are really not my thing, but . 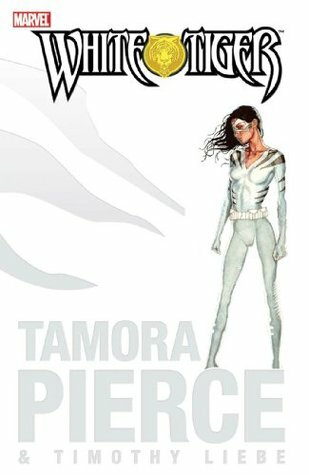 . . seeing Tamora Pierce’s name on the cover was definitely enough to get my attention. Who knew she even wrote for them at all?! But yeah, badass heroine types are something she’s a bit of an expert at writing, so I had to give it a try. White Tiger gets definite points for exactly that–a strong female lead who manages to be both competent and yet human. She has struggles, needs relationships, gets frustrated, and that’s exactly what makes her such a likeable lead. Extra points to the authors for bringing in lots of diversity, some real humanity, and a welcome sprinkling of humor in the midst of all the action. What brings the rating on this to only a “liked it” for me is the ways that it falls more in line with your traditional comic book. There are a lot of action scenes that are honestly hard to follow and not especially interesting–seriously, the random personal interactions are way more fun to read. Secondly, this story is so very woven into the Marvel ‘verse that there are a ton of characters and events thrown in that I just don’t know anything about, so a lot of the connections here were just lost on me. What I’m trying to say is that, were I actually into the Marvel scene, this would probably have me fangirling with a 5 of 5 rating; it really is good for a graphic novel of this sort . . . it’s just a bit too much of a traditional comic to really be my thing.